Dear Eleanor, I am Ana Castillo, from Spain. I have a little girl who is 10 years old and who read the first book you wrote regarding Sammy Feral’s Diartes. She is chasing me to buy your second book (Yeti Rescue). I am not able to find it in a Spanish version, here in Spain. She was so exciting reading your book, she told me that it has been with out any doubt the best book she have read in her life. Do you know where I could locate it in Spanish?. I also would like to congratulate you, since it is realy difficult to find books for our children so fascinating. When is the next Sammy feral diaries of weird book coming out? I’ve written five Sammy Feral books (Sammy Feral’s Diaries of Weird, Yeti Rescue, Hell Hound Curse, Dragon Gold and Vampire Attack). At the moment I don’t have any plans to write any more, but you never know what the future holds…! Have you read either of the books in the Felix Frost Time Detective series yet? If not then you might enjoy those too! Thank you for letting me know that you’re a Sammy Feral fan! Have you read all five Sammy Feral books? There’s Sammy Feral’s Diaries of Weird, Yeti Rescue, Hell Hound Curse, Dragon Gold and Vampire Attack. I’ve also written two books in the Felix Frost Time Detective series (Roman Riddle and Ghost Plane), which you also might like to check out! Thanks for your message! It’s great to hear that you’re a fan of The Blue Lady and The Grey Girl. What were your favourite parts of each book? 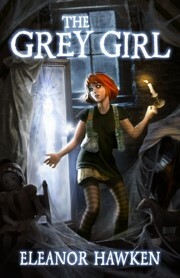 I’ve written some other books for younger readers (The Sammy Feral and Felix Frost series), but The Blue Lady and The Grey Girl are the only ghost stories I’ve written so far.